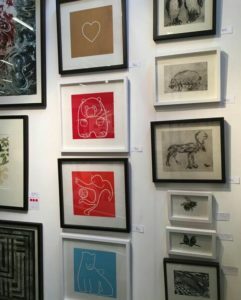 Artichoke Printmaking exhibited my linocuts at the Affordable Art Fair, Battersea Park, this autumn 2017. You can see my new work including my Footballer and my Panda in red in the photo. The Polar Bear and Baby Linocut is in blue and Heart is at the top of the display.